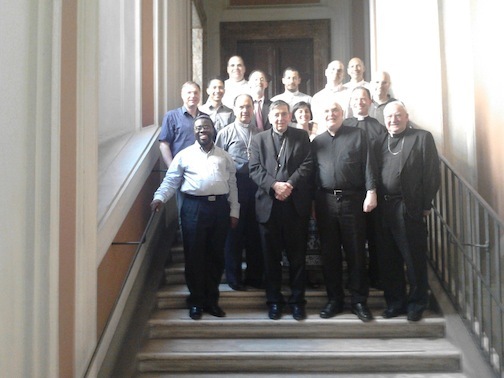 The second round of the third series of Consultations between the World Evangelical Alliance (WEA) and the Pontifical Council for Promoting Christian Unity (PCPCU) took place 12-17 September, 2011 in Rome, Italy, and was hosted by the PCPCU. The meeting focused on “Sacred Scripture in the Life and Mission of the Church” with a special emphasis on the relation between Scripture and Tradition. The first round in this series, which was held in São Paulo, Brazil in 2009, studied the topic of Ethics/Moral theology. The first series of consultations between some members of the WEA and the PCPCU took place between 1977 and 1984, and resulted in the report: “The Evangelical- Roman Catholic Dialogue on Mission”. The second series of consultations, 1993-2002, produced a report entitled “Church, Evangelization and the Bonds of Koinonia”. This year’s consultation was held in a prayerful atmosphere of growing trust and fellowship. Cardinal Kurt Koch and Bishop Brian Farrell, the President and Secretary of the PCPCU, welcomed the members of both teams and, after an update on the state of the Consultation, reflected on the aspiration to continue to work in a spirit of Christian solidarity. During their stay in Rome, the participants had the opportunity to visit some significant Christian sites. The current consultations are coordinated by Rev Mgr Juan Usma Gómez (Vatican City/Colombia) for the PCPCU and Rev Dr Rolf Hille (Germany) for the WEA. The Evangelical team members also included Dr Leonardo De Chirico (Italy), Rev José de Segovia Barrón (Spain), Rev Dr Joel C. Elowsky (USA), Rev Dr Timoteo D. Gener (Philippines), Prof. Dr James Nkansah–Obrempong (Kenya), and Prof. Dr Claus Schwambach (Brazil). Rev James Kautt (USA/Germany) attended the meeting as an observer. The Catholic team members also included Bishop Donald Bolen (Canada), Bishop Rodolfo Valenzuela Núñez (Guatemala), Rev Gregory J. Fairbanks (Vatican City/USA), and Ms Beatriz Sarkis Simões (Brazil). The main papers delivered were “Scripture and Tradition in Catholic Doctrinal Understanding” by Bishop Donald Bolen and “Scriptural and Tradition in an Evangelical Context” by Rev Dr Joel C. Elowsky. This series of consultations will continue with a third round meeting in 2012, which will be hosted by WEA, and will examine Catholic and Evangelical perspectives on Salvation.